Interactive, Engaging, Powerful & Effective. StarPower engages students in a memorable interactive way. Experience how power, or lack of power, can profoundly impact people and/or organizations. Examine how easily power can corrupt, and how disenfranchisment feels and manifests itself. Allow participants to examine their own bias and focus on how they perceive the use & abuse of power. Initiates immediate, personal change and makes participants personally aware of the issues around power, powerlessness or diversity. fraternities, non-profits, volunteer groups, churches, orientations, youth groups, cross cultural organizations and many more. StarPower Simulation for Schools & Charities. 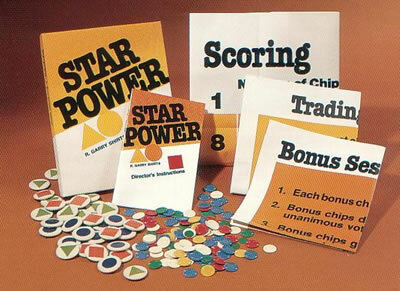 Since its creation in 1969, StarPower® has been our most popular simulation. By conservative estimates, three million people have played it. Some instructors have used it with more than 100 different classes or groups. It provokes participants to rethink their assumptions about the use and abuse of power. StarPower is a real time, face to face, non-computer based simulation game of an organization or system in which leaders are given unlimited powers to make and change the rules of the simulation. Participants have a chance to progress from one level of society to another by acquiring wealth through trading with other participants. Once the society is established, the group with the most wealth is given the right to make the rules for the game. The power group generally makes rules which maintain or increase its power and which those being governed consider to be unfair. This generally results in some sort of rebellion by the other members of the society. Groups concerned about the ethical use of power. This generally includes peace groups, classes on racism, diversity, ethics, and almost any other course or activity concerned with making the world a better place to live. Teachers of business, sociology, psychology, political science, economics, or history, who believe that it is important for their students to experience and understand power as a concept. Those who are interested in teaching people who have power how to use their power in an appropriate manner. What are the unique features of StarPower? The most unique feature of StarPower is the strength of the impression it makes on the participants. It sneaks up on them. During the first two rounds, the atmosphere is very social. People are laughing, talking, exchanging chips, and having a good time. When the announcement is made that, “because the squares have worked so hard, they now have the right to make the rules for the game” participants begin to sense that more is going on than the exchange of a few chips. Then, when the Squares pull their chairs in a tight circle and begin whispering conspiratorially about the rules they want to make, the social atmosphere evaporates and the players become very earnest about the game. Without really being aware of it, “winning” the game has become very important. And because it is important, the actions, decisions and behaviors are important. Each of us may be more vulnerable to the temptation to abuse power than we realize. Power can be amazingly seductive. To change behavior, it may be necessary to change the system in which that behavior occurs. Few people are likely to participate in an endeavor if they feel powerless. If rules do not have legitimacy, they will not be obeyed. What seems fair to those in power is not likely to seem fair to those who are out of power. Persons who are promoted rarely remember those they leave behind. Power is like fire, it can be used to help make the world a better place to live or it can be terribly destructive. In any system, there needs to be checks on power. If there are no checks, power will almost certainly be abused. StarPower Kit includes all materials necessary. How long does StarPower take? It is best to plan one and one half-hours for the playing of the game and a half to one hour or more for discussion. If time is an issue, it can be played in one fifty-minute period and then discussed the next period. How many participants does a StarPower kit accommodate? A minimum of 18 and a maximum of 36 can participate. It can be run with as few as 12 participants but we recommend a minimum of 18. Preparation requires approximately one-half hour to one hour for the inexperienced instructor; less for the person who has been through it or is an experienced simulation facilitator. Are any consumable forms or special equipment needed? No. All materials to run the simulation are included in the kit. There are many ideas, beyond those listed below (click +/-), which may emerge in a discussion of the StarPower simulation and it is likely that each facilitator will want to examine the implications of such ideas for the specific topic under consideration. For instance a facilitator concerned with improving relations between two racial groups, between employers and employees, or between men and women, might discuss the parallels between the powerlessness felt in situations created in the simulation. Generally however, groups need to discuss the simulation in personal terms of “who did what to whom”, before going on to the issues involved. This can be an important experience in interpersonal relationships, helping members of the groups to understand their reactions to authority, competitive situations, etc. StarPower is a situation which is competitive, has only a few winners and is highly unbalanced with regard to the distribution of power. Such a system almost invariably produces aggressive, authoritarian behavior. It would be possible to take a group of aggressive StarPower players and put them in a social system that rewards openness, honesty, warmth and tenderness and have them act entirely different; not because they are any better or worse as individuals but because they are operating in a different social system. Consequently, many of our efforts to improve relations between races, different factions of the community, and improve morale in businesses are doomed to failure if we also don’t try to change the social system in which they operate. Each of us may be more vulnerable to the temptation to abuse power than we realize? Before the simulation, most players would agree with the statement of Lord Acton who said, “Power tends to corrupt and absolute power corrupts absolutely”. But after the simulation, they assert their belief with a new respect for its validity. At least the Circles and Triangles do. The Squares sometimes have a hard time admitting that they abused their power or that they enjoyed exercising it. The Circles and Triangles are generally quick to point out instances where the Squares did not treat them fairly such as arbitrarily rejecting proposals by the Circles and Triangles, claiming special privileges, restricting the right of the Circles and Triangles and so on. Also, such non-verbal behavior as pulling their chairs close together, laughing devilishly and being unusually animated as they made their rules, would seem to suggest that perhaps they enjoyed it. And that, of course is the point. The reason power is corrupting is that it is intensely satisfying, makes one feel supremely important and creates an insatiable desire for more power. Few people can resist its influence. If this is so, then the clear implication is that we must not only try to avoid abusing power ourselves, but also guard against its abuse in politics, business, schools, families and in on-to-one relationships with others. The idea that power corrupts as well as the other ideas which are listed below are often known by the participants before they participate in the simulation. Yet, when participants of all ages and sophistication are asked to place a value on what they learned from participating in StarPower, they consistently report that it was “very important” to them. In looking into this seeming contradiction of participants placing value on learning concepts which they already knew, it seems that the playing of StarPower has given new strength and validity to old but important ideas. It is one thing to know that power corrupts everyone, it is quite another to realize that power might also corrupt Ted or Mary or even oneself. This realization can often help the participants look at these ideas with a new perspective – an ideal time to re-evaluate them, to determine if there is still truth and meaning in them, to apply them to one’s own discipline or situation or simply re-affirm their importance. When the Circles and Triangles realize that the Squares are not going to be fair with them, they generally drop out psychologically or, physically, try to sabotage the efforts of the Squares, or seize the power for themselves. This is not a new or surprising idea, but experiencing it directly can often help people see the behavior of those who are reacting to powerlessness, real or imagined, with a new tolerance and understanding. When the Squares are given the power to make rules they are told they can make any rules they want but they must also enforce any rules they make. They rarely pay much attention to the enforcement part of the statement until the Circles and Triangles decide to disobey them. Then the often appeal to the director to make the Circles and Triangles obey them, and they have to be reminded that it is their duty to enforce the rules. They generally respond by piling on more rules which also are not obeyed. This raises several interesting questions. Under what conditions is it possible to make unfair rules and have people obey them? Is it worth the price? Are people justified in disobeying unjust rules? Always? What seems fair to those in power, is not likely to seem fair to those who are out of power. Even when the Squares willingly admit that their rules are not fair, they often cannot understand why the Triangles and Circles are so upset. If a measure of perceived fairness were available, there is little question that there would be a great disparity between the Squares and the Circles/Triangles’ perception of what is fair. It is this discrepancy which often creates serious communication gaps between administrators and teachers, management and labor, the legislators and the people, the rich and the not-so-rich. When a Circle or Triangle is promoted to the Square group, he or she almost always participates in the rule making which discriminates against the Circles and Triangles. Even when they do protest during the rule making, they will often use the rules to their own advantage and to the disadvantage of the Circles and Triangles. There is a question, or course, whether they would identify so closely with the Squares, if they continued to wear their Circle or Triangle badges after being promoted or if they had been sent to the Square group with the express purpose of representing the Circle and Triangles. When participants finish BaFa’BaFa’®, they know what it feels like to be the one person in a group who is different. They understand how easily stereotypes can be developed and what must be done to overcome them. Power of Leadership is a real time, face to face, non-computer based simulation that helps students understand the value and dangers a leader faces when he or she attempts to use the power that goes with a position. Rafa’ Rafa’ is a simplified version of BaFa’ BaFa’ and therefore better suited for younger students. Where Do You Draw the Line? helps participants understand the actual principles that most people use to make ethical decisions. We often customize this simulation to target specific ethical issues. Guns or Butter helps students understand current events at a visceral level. It’s one experience for a student to see a news report on North Korea’s plan for nuclear development; it’s quite another to see such a report and be able to feel as though you’ve been through a similar experience and can understand the pressures felt and decisions that leaders made in creating the situation. How it was used? For programming within a university residence hall. Description of the class or training it was used in? Within this 280 resident hall, student paraprofessionals are required to complete programming initiatives for the residents they work with. StarPower was used as a large scale intensive program for these residents. What was the objective or focus of the class? To teach residents the importance of power, abuse of power, and leadership. How and why you used our product to help toward that goal. Feel free to include other resources you used, including your expertise or other products? StarPower is by far the most impactful and meaningful way to teach the lesson of abusive power to students. I love the learning moments that students walk away with. Description of you or your organization along with any contact links you’d be interested in publishing (website, email, phone). Stated above. Anything else you may find interesting. I had 35 residents attend. 4 of these residents were paraprofessionals that I directly supervise. 4-5 other residents had other leadership positions or paid positions across campus. Thank you for another great StarPower experience! When I taught both in high school and in the UCSB teacher education program I considered the Star Power game to be hands down the best simulation to teach students about power and social stratification. I found that using it in a world history class (nowadays 10th grade in California) was particularly worthwhile and did so in the first week of the school year after which the rest of world history started making sense to the students: e.g. the role of aristocracies, the acceptance of status quo, the curious lack of revolutions in most of human history and the actual reason for revolutions when they did occur. In spite of the advent of the internet (after I had bought the game in 1985) the game continued to retain its effectiveness because of its elegant design: simple rules, socially interactive, richness in real-life analogies. Among the many sessions I held were two I remember vividly: In one session, a small group of girls had positioned themselves in the rule-making group. When they realized that some of their classmates voiced some strong opposition to the new rules, the girls then made a rule that the 4 of their classmates, stars of the football team, should be in their group. The 4 young men eagerly accepted the role and promptly proceeded to expel the females from the group and forced their own rules on the class. The next day, a coup had occurred in Liberia, and the students promptly made the reference to the game. I suspect that most adults don’t really think about what a “coup” really implies, but these 10th graders certainly did. I assume it was Gary Shirts, who first came up with the game as I remember seeing the name on the booklet that came with the game. If, as I hope, he is still alive, you may thank him for some of my most successful days as a teacher. I would love to see more history teachers purchase and use this game. I understand that you focus on the business community, but I wonder if presentations at conferences such as the National Council for the Social Studies might be worthwhile. I regularly receive your emails and now that we have come to the end of the semester, I find I have the time to respond with some information on how I use your simulation products. I use a variety of simulations in many of my classes and have found that a couple of yours are particularly engaging for my courses. I have used Bafa Bafa and Starpower for more than a decade in a variety of courses and in my volunteer work as well. I have designed my social problems class to center on games as anchored learning introductions and build the content around those first debriefings. The design has been so successful that I have a published article on its use that continues to be downloaded regularly, I answer dozens of emails a year on how to incorporate the simulations into the classroom, I have given dozens of workshops, and I even had a colleague adopt the curriculum this past year. I have used both simulations in my classrooms, in teaching camps for future social studies teachers, in elementary and middle school classrooms as a volunteer, and even in my troop as a Girl Scout leader. Additionally, my colleagues and I have used both (or versions of both) in many interdisciplinary workshops and courses to help students bridge content from one course to another. When I do workshops, I always have individuals ask which simulations they should use to start. I use one that is homemade and free and so that is often the one I demo and provide. Beyond that, I always tell them that for sociology classes if they can buy only one product on the market it should be Starpower. I have found this to be the most grounded experience for my students in all of our classroom discussions. We even adapted our version for a famine unit in our Global Threats and Problems course (an interdisciplinary course that includes political science, economics, geography, and sociology.) When my departmental colleague used Starpower for the first time this year, he shared the experience after his class. His excitement reminded me of how much I like the teaching experience when I use simulations. In workshops, I have found that while instructors like the idea of simulations, it is often as a one-time “bonus” learning for their classroom. Fewer faculty members have the direction or experience to build simulations into an overall design like anchored lessons, or ARCS. I have briefly thought of creating a consulting company to help instructors develop those skills, but building a business is not up my alley. I will leave that exciting experience to you and the other businessmen. One thing that I truly like about your sight is offering contact information with individuals who can help with these skills. I think those resources can help them integrate the products for maximum impact. It has been a few years since I have been scheduled for Social Problems (the course with a full simulation design) but if I stay in academia after this summer I will be teaching it in the fall. Our first content simulation is Starpower. After using it, or a version of it, for at least one class in each semester for fifteen years or so, I still enjoy the immediate enlightenment that it provides.